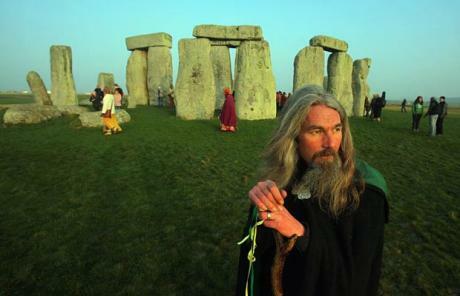 The Druids were the “wise men” of the pagan Celtic society. Little is known of them with certainty; however it is thought that they played the roles of priests in the Celtic religion. Most folks know that the holiday we call Halloween is derived from the Celtic festival of Samhain. This was one of the great Celtic fire festivals and marked the end of the harvest and the beginning of winter. The Celtic people believed that on this night the gates between life and death were open – or at least poorly guarded. Part of the role of the Druid priests was to protect the people from the spirits who might cross over. Placating such spirits is thought to have been the origin of the trick or treat tradition. Other information suggests a variation of this idea, that the souls of sinners who had died during the year were held in torment. They could only be released and given peace if the gods were pleased by the Samhain offerings. Since the barrier with the spirit world was thin on this day, Halloween was the perfect time for divination. The Druids have been said to have been called upon to predict everything from next year’s harvest to an individual’s marriage prospects. As said at the outset, little is known for certain about the Druids. There are only a few contemporaneous textual references to the Celtic religion whose myths were mainly handed down through oral tradition. Most of our modern image of the Druid is really just Romantic myth, like these. Druids DO NOT worship the Devil or Satan on Halloween. NOT ALL PAGANS ARE SATANISTS. Today Pagans see Samhain as a time to honor the dead, not as the dead, but as the living spirits of loved ones and as guardians who hold the wisdom of mankind. It is a celebration of the afterlife where we do not die but rest and continue to learn and prepare for our next incarnation. Most modern day Wiccans and Druids have attempted to reconstruct as accurately as possible, Celtic beliefs, rituals, and other practices. A typical celebration of Samhain might involve decorating an altar with autumn flowers, pine-cones, small pumpkins, and decorative gourds. They sometimes perform a ritual purification by taking a solitary bath. They do not perform séances, as do Spiritualists. They do not summon or order back the dead. They do, however, believe that, if the dead themselves wish it, they can return to share in the love and celebration of the occasion. Pagan Druids often consecrate and share cakes and wine (or perhaps muffins and cider). Many myths have been perpetuated by people who have seen too many horror movies and the Christian idea of horrific and mythical forms of Satanism. Miller, Tara “Druidry: Knowledge of the Oak”. Monroe, Douglas. The 21 Lessons of Merlyn: A Study in Druid Magic and Lore. Llewellyn Publications: St. Paul, MN, 1992. I have just sent this to my friends who also share the same views on this.